In order for me to forgive Carter he has to admit to his distortions and lies and publicly renounce his books and speeches. 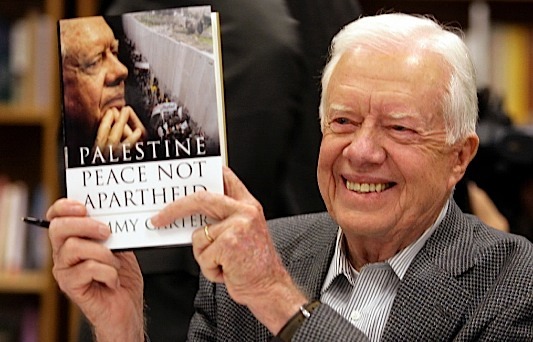 Carter needs to return money to anti-Semitic Middle Eastern countries that back his center. He needs to replace Habitat for Humanity with Hadassah. He needs to go on Birthright Israel. He needs to listen to Matisyahu. He needs to watch G-d Cast, read The Forward, spend the winter in Miami. He needs to study Judaism with Rabbi Telushkin, and volunteer for Challah for Hunger. We need to see Jimmy Carter crusading against the humanitarian track record of Hizbollah, Hamas, and Fatah, and doing brunch at Jeff’s Gourmet Sausage on Pico. While he is on this apology tour, he needs to appear at every campus where he defamed Israel, and give speeches urging that Muslim extremist recruiting groups like the MSU and MSA be banned permanently. He needs to learn Hebrew, spend Shabbat at Beit Jewlicious, and sit at David Abitbol’s feet and learn about the expulsion of North African Jews, Sephardic Jewish culture, and eat chumous. And that is just for starters.